To become Superman you have to find a Kryptonite Meteor. 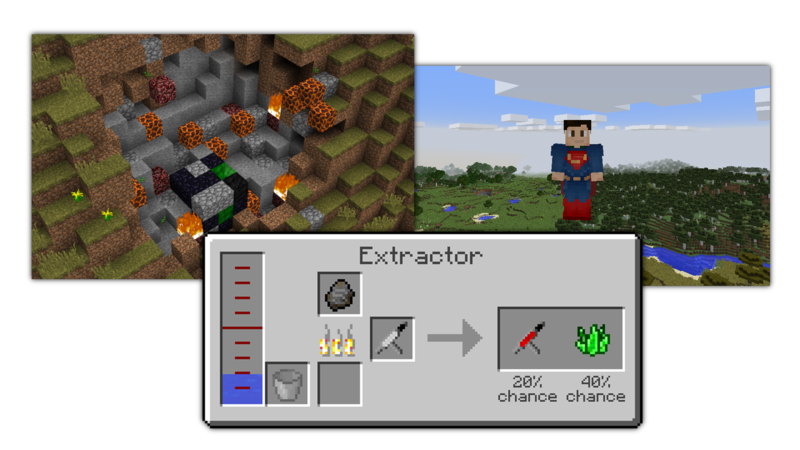 By mining the Kryptonite blocks you might be able to get a Kryptonian Fossil. Put this in an Extractor and you can get an injection which makes you a Kryptonian. As Superman, you are able to gain power from the sun. Once you have enough solar energy you can fly or use heat vision. Somewhere in the world you can find a lonely Mjolnir laying around in cratre. If you are worthy enough (your karma needs to be atleast 201) you can wield this weapon to become the God of Thunder. Spinning the hammer allows you to fly. Shift-leftclick it to throw it. You are also able to make lightning attacks while you wield the hammer, but if you reach level 10 by using the hammer frequently you can strike lightnings even without Mjolnir and go into the God Mode which increases your strength. If you find Mjolnir in a cratre you can also find Uru Ore in it. This metal can be used to create a new weapon. After you have found a Stormbreaker Head Cast (or Mjolnir Head Cast) in a Norse Village you can craft Stormbreaker. You can also make this crafting process more interesting using TinkersConstruct or ThermalExpansion. Use JustEnoughItems to see the recipes. The Black Panther has been the protector of Wakanda for generations. Travel around the world to find the rare Heart-Shaped Herb which only spawns above Vibranium (so if you find this flower, you should look for some Vibranium somewhere under it). You can also place grass blocks above Vibranium Ore/Blocks and after some time the Heart-Shaped Herb will grow. By drinking its potion you gain super strength and various other abilities. You also get an instruction to build the suit which can absorb and redirect kinetic energy. The Super Soldier serum gives you extra strength, damage resistance, etc. You get by crafting the Vibranium Shield. If you paint that shield by putting it in a crafting grid with red, blue and white dye you are also able to put on Captain America's suit. This may not be a superpower but still effective in combat: The compound bow can be used with special arrows like the explosive, smoke, gas, sharpened, vibranium, kryptonite and grappling arrow. Crafting the bow also gives you the possibility to get Green Arrow's suit. Every now and then you can find crashed kree ships in the world. The surviving Kree will try to attack you, but if you kill them you can get their flesh. Using this in an Extractor (use JEI to see the exact recipe) you are able to get an injection which grants you the Kree Hybrid power. With those you have super-human strength, you can fly and by getting certain damage you charge up your Energy Absorption power. If you enable this you can use this energy to make more damage. To get Captain Marvel's suit you have to look in the chests of the crashed kree ships, you might be able to find an Instruction in them. The Spirit of Vengeance takes over you when "bad" mobs are near. As soon as that is the case you can't control your player. With each kill you gain XP, and with each level up you get more control. To become the Ghost Rider you must have bad karma (Karma system from LucraftCore) and die. There is a slight chance you will be asked to seek vengeance on those who sinned. Weapon X lets you have claws you can draw out. Additionally you get an extreme healing boost and enhanced capabilities. Killing wolves can give you Claw-items. Putting those into a DNA Extractor (from LucraftCore) will give you injections you can take. Once you took one of them you need to take much damage. There is a small chance that that damage might trigger your powers. You can find craters in the world which contain Hammers. To pick those hammers up you need to be worthy. You are worthy if your Karma Class is at least Superhero. Use /karma to look up your stats. To become The Hulk you have to build a Gamma Bomb. It is a 3x3x3 structure of Gamma Bomb Casing blocks with an Uranium Block in the middle and a Gamma Bomb Control Block on one side. As soon as it blows up, you might become the Incredible Hulk. At the beginning you can't control him, when your health is below 3 hearts you turn green and attack everything near you. By killing you gain XP and level up, what allows you to control your inner alter ego at level 10. Villages now contain new houses: Spider-Labs! You can find an extra room in them in which you'll see radioactive spiders. From now on you know the rest: Getting bitten by one of them might bring you your powers.